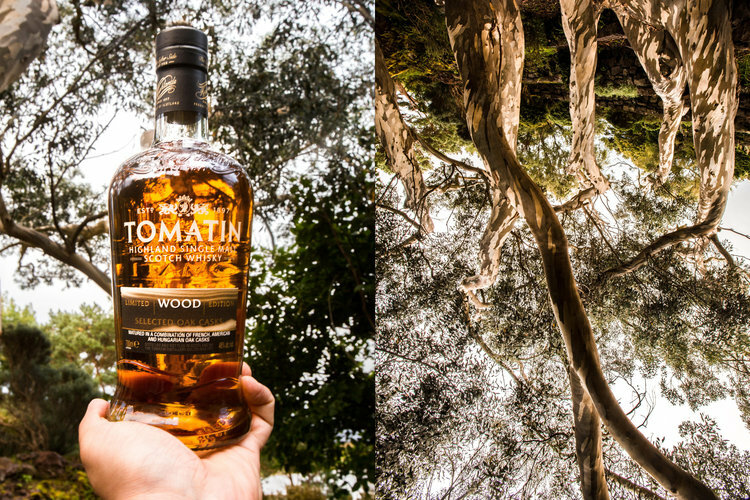 Tomatin Whisky - Wood — NORTH BLOG. Our adventure around the North of Scotland visiting all these beautiful places meeting all sorts of amazing people along the way was coming to an end. For a small country Scotland has an abundance of many beautiful places that are waiting to be discovered and explored, and the amount of breathtaking views that we have here continues to amaze me. It was our last challenge of the Tomatin ‘Five Virtues’ Whiskies Challenges. l was excited about this one today because l am a man who loves nature and everything that thrives outdoors. Our challenge today is to visit Inverewe Gardens locating the huge California Redwoods of the Highlands finding the perfect area to enjoy a nip of Tomatin WOOD Whisky. Inverewe Gardens is in a beautiful area of Scotland overlooking Loch Ewe, it’s truly an amazing sight walking through the garden seeing the amount of different botanicals that you wouldn't normally expect to see in Scotland with the climate that we are in and how far North we are. It was lovely seeing the Himalayan Blue Poppies taking me back to my time spent climbing in the Himalayas and seeing some of my favourites which I didn’t expect to see like the Wollemi Pines which have such an odd unique beautiful look. I am loving every moment of this! It didn't feel like I was in Scotland one bit, the time and care that has been put into this garden is something that you would expect to see from Alice and Wonderland, and the smells of all the different species of plants and trees were remarkable. I was hoping to get glimpses from the garden of the seals and otters in Loch Ewe, unfortunately they must have all been hiding. Finally we found the beautiful California Redwoods, they were massive, making us feel very small. They stood like giants, I definitely took a moment and gave one of them a big hug trying to wrap my arms all the way round. After my treehugger moment we headed back to the area that l felt was the perfect place to enjoy my dram of Tomatin Wood Whisky overlooking majority of Inverewe Garden and Loch Ewe. I think I found the most picturesque location for this moment and it just felt right. I got my glass out, and made sure I got a good amount of whisky. Tomatin Wood Whisky definitely didn’t hold back, I got an instant taste of Oak then the aroma of a burning wood almost like an incense burning when you walk into the room and you can almost taste the intriguing musky scent. I got a deep smoky taste, it was charming with a fresh intense lingering aftertaste as if someone had made a fan out of leaves blowing the air into my face but this was all going on in my mouth. Sacred tobacco ceremony like. The smell was lovely, it made me feel happy and really did bring out the inner nature child within me, making me feel free and liberated, yet there was a strange contradiction as I also felt rooted and this maturing. It tasted ancient almost. The whisky brought me back to that moment of when you’re sitting around a camp fire, hearing that crackle and pop of fresh wood giving off all those natural wooden scents. It made me feel warm on the inside almost like getting a hug back from that tree, and I could have happily sat there all day and enjoyed the rest of the Tomatin ‘Wood’ Whisky. It was time to leave beautiful Inverewe Gardens and make our way back to the Tomatin Distillery for a meeting with Graham Eunson (Distillery General Manager) discussing what we had learned about the elements connected to the whiskies and what we got from each of Tomatin’s ‘Five Virtues' Whiskies. It was an absolute privilege being in Graham’s company, we had learned a tremendous amount about the art of whisky, some of the skilled folk involved, what goes into it, the history behind each bottle, what it means for a distillery to produce each product, how important our home Scotland is for the production of these fine whiskies, how our culture and nature plays a huge role in the creation… the magical potion almost, that is put into each cask, how each bottle tells a story. The knowledge that is passed down from generation to generation is an art within itself in the whisky industry and this is why Tomatin is thriving in all areas, they are sticking to and celebrating their Scottish roots as with whisky this is how the magic is created and maintained. They aren't just great to drink and taste, they tell a story through your senses. It is a very exciting time for Tomatin and l am extremely excited to see how people experience the ‘Five Virtues’ for themselves, as they are great tasting whiskies, but they may also add an extra element on your adventure. May the magic of these whiskies touch your soul like they did mine. "We were paid a small fee to take part in the creation of Tomatin's Route 501, however all our thoughts/opinions are our own."